Charlie Telfer has been surprised by how quickly he has adapted to life at Dundee United following his summer move from Rangers. 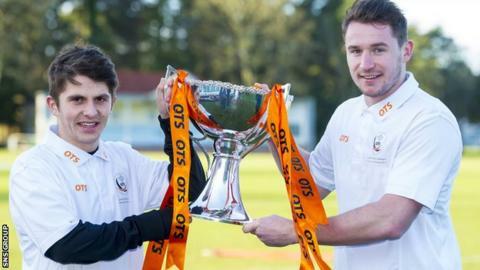 The Tannadice club paid a £204,000 compensation fee for the 19-year-old midfielder last month. "I thought it would be difficult because I'd been with Rangers for so long," Telfer told BBC Scotland. "But the transition has been smooth and now I'm just trying to make an impact for the team." The teenager has featured in 11 games this season and scored twice in Saturday's 3-1 win over Motherwell to double his goals tally so far. And his impressive display was praised by manager Jackie McNamara ahead of this weekend's League Cup semi-final with Aberdeen. "The style suits me down to the ground," Telfer explained. "Getting it down and playing on the attack, trying to break teams down." Saturday's game was just a fourth start for the midfielder as McNamara made seven changes, resting key players like Nadir Ciftci, Gary Mackay-Steven, John Rankin, Paul Paton and Chris Erskine. "It keeps everyone on their toes," said Telfer in reference to the manager's rotation. "Players that maybe think that they are definitely due a start aren't so sure because the players coming in have done well. "It's a good problem for the manager to have. "For the semi-final, I'll be delighted to be involved, even if it is coming off the bench." Dundee United began this campaign with a 3-0 victory at Pittodrie but Aberdeen enjoyed revenge at Tannadice in December, winning 2-0. "They were very good on the day, although we were not at our best," explained Telfer, who was an unused substitute on that occasion. "They are strong defensively and we will need to work hard to break them down. "Everyone is looking forward to the semi-final and determined to get a good result. "We started the season really well then we had some poor results away from home but we're unbeaten this year and hopefully we can keep that going and kick on. "We're strong at the back and good going forward and when it clicks together I'd say we are really strong team."